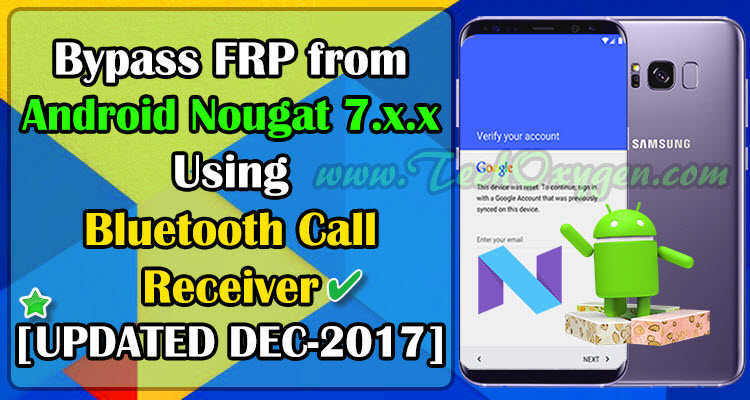 Samsung FRP bypass is the best solution to unlock Google verification from Samsung smartphones and tablets in 2018. 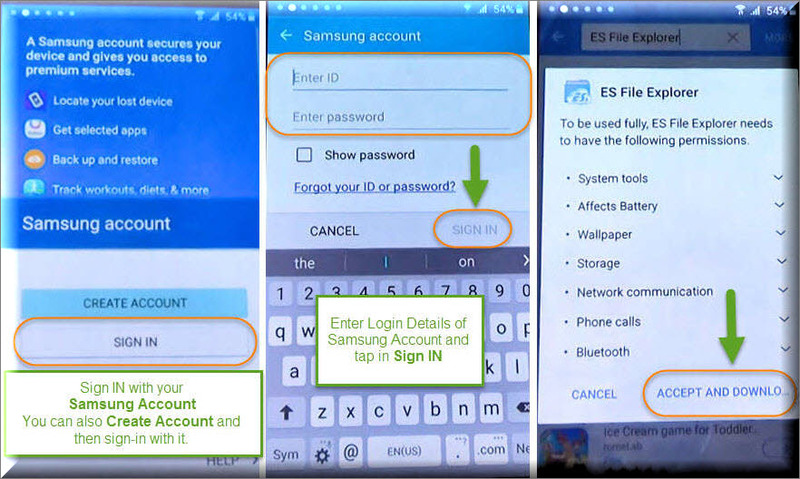 In this guide I will elaborate a new method of (2018) for Samsung Galaxy devices, about the use of Samsung FRP bypass tool to unlock Google Account Verification. 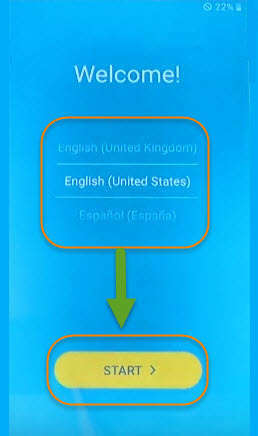 Free and easy (more easier than previous method), on all series or models of Samsung Galaxy smartphones. Obviously for some reasons after hard resetting the Samsung Galaxy device, in the initial setup the phone is asking to enter the details of previous synced Google Account to complete the initial setup successfully. What is FRP Lock and why you are facing it? 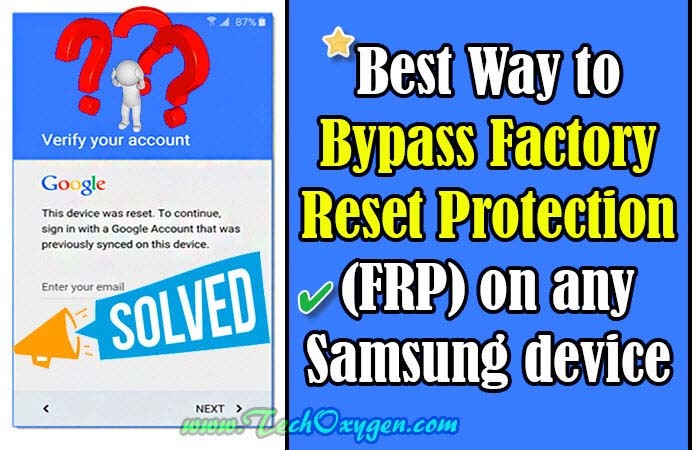 Samsung FRP Bypass of (Factory Reset Protection) is a security feature introduced by Android Company for all the Android Operation System (OS) based phones. This feature activates when the device being hard reset based on its OS (Operation System). Android Version (OS) from Lollipop 5.0.1 to Nougat 7.1.1 or higher having this security system, it means whenever a device reset it is necessary to provide the complete details of the initial setup including the “Google Account Verification” section. In Google Account Verification, a person should have to enter the right details of the google account which are “Gmail ID and its Password” to proceed the initial setup to the next step. Unfortunately many of users doesn’t know about the previous synced Google account information, therefore they go for the Official Samsung Support or their franchise but Samsung is not gonna help them without getting back a pair of dollars or sometimes they even refused to do that. We came across this situation and found many ways to break that security feature “FRP lock” from Samsung Galaxy phones for absolutely Free. 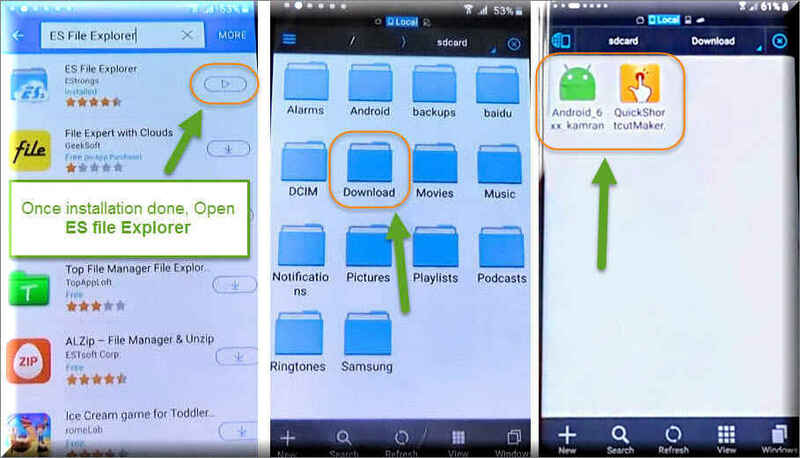 However we have already posted many Step-by-step guides to deactivate FRP or Bypass Google Account from lots of Samsung Galaxy models (Samsung Galaxy C3, C5, C7, J1, J2, J3, J5, J7, A3, A5, A7, On5, On 7, S5, S6, S7, NOTE4, NOTE 5, NOTE 7, EDGE, PLUS, NEO, GRAND, PRIME, PRO, TAB, XCOVER) or other smartphone companies like HTC, Huawei, Motorola, LG, Sony Xperia, Alcatel and so on. Fortunately, today we are including an other helpful and massively easy guide to unlock or break FRP and remove Google Account from any Samsung Galaxy Phone having Android Kitkat 4.0.3 to 4.4.4, Lollipop 5.0.1 to 5.1.1, Marshmallow 6.0.1 to 6.1.1, Nougat 7.0 to 7.1.2. 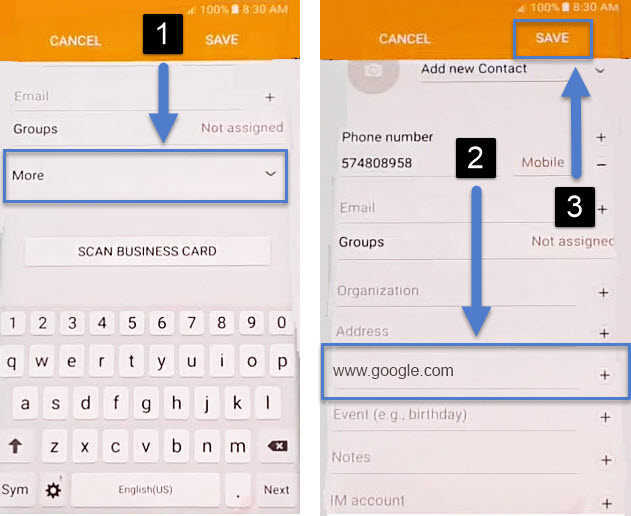 Follow this Step-by-step guide with a clear elaboration, using the images to make it more understandable and easy for users to apply it on their phones. 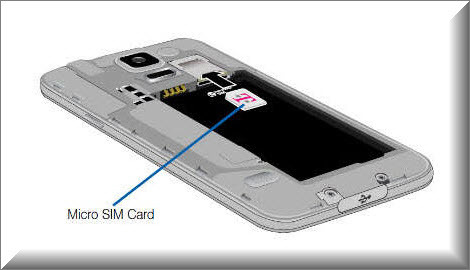 1st Step: Power off the phone and insert an active Sim-card then again Power it up. 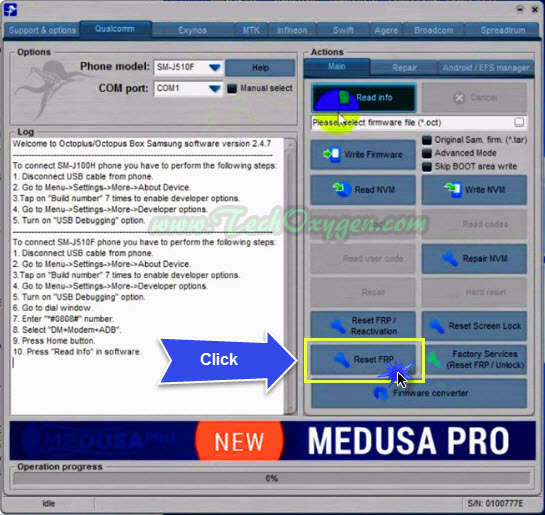 2nd Step: Turn on the Computer and download RealTerm 2.0.7 and Android Samsung USB Drivers then install them into your computer. 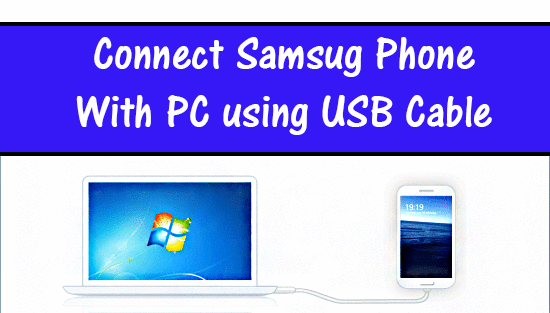 Connect your Samsung Galaxy phone with computer using USB data cable. Then from left side click on Device Manager. 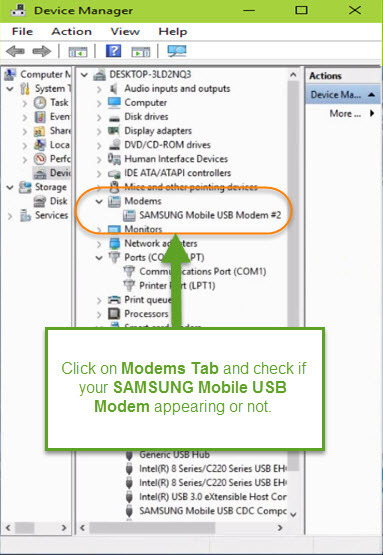 Go to Modems > and right click on SAMSUNG MOBILE USB Modems and select Properties. 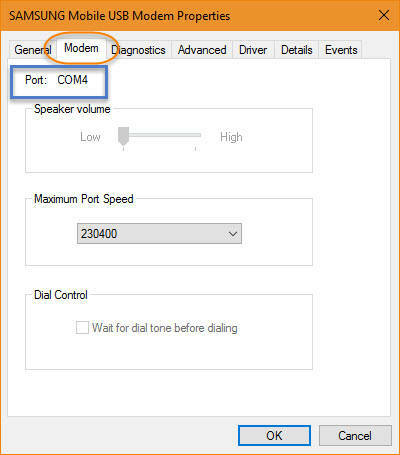 Select Modems Tab and check what Port : COM? is appearing here. After that, Open RealTerm software and make sure 2 or 3 green lights are appearing in the Status section of RealTerm. 3rd Step: Inside Display section, Check on Half Duplex then go to Port section and make sure here Port is same as the Port COM? which you checked from the properties of SAMSUNG Modems section. However, you can change the Port(Number) if it’s different from Port COM(Number) and then click on CHANGE in RealTerm. Copy this command and paste it then click on “SEND ASCII” button. 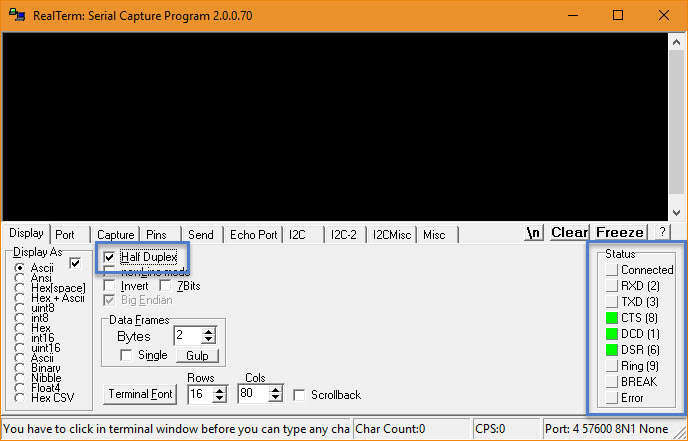 After that, Copy 2nd command and paste it then again click on “SEND ASCII” button. 4th Step: Immediately after clicking SEND ASCII button, phone will start calling to that number. End the call and tap on Create Contact. 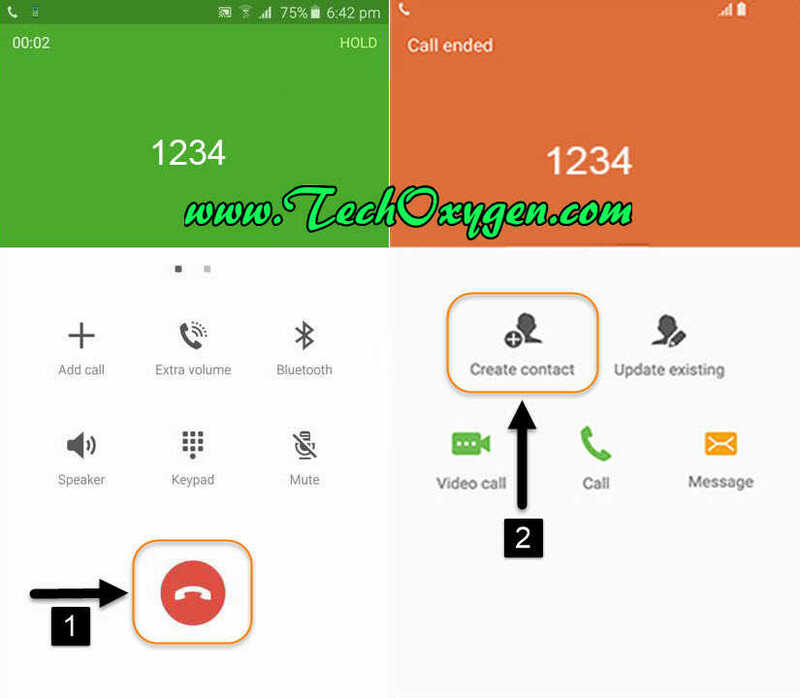 Save contact to Device, enter name TechOxygen, Pone number will be 1234 or any other if you’ve changed it. Scroll down and tap on More. Tap over Web Address and type www.Google.com and Save the contact. 5th Step: It will redirect to the Verify your account screen, Now again click on SEND ASCII button (The 2nd Command should be pasted the same) and again phone will call to that same number just tap on End Call > and select View Contact. 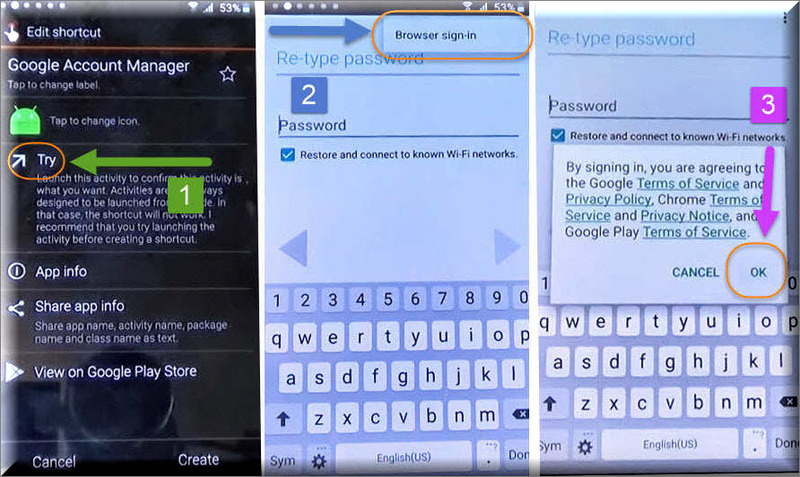 This is the step which helps you to connect with the internet to Samsung FRP bypass tool your android device. Then press on Earth Icon inside web address and it will access to the Google.com through internet. After accessing to Google.com you can disconnect your phone from USB cable. 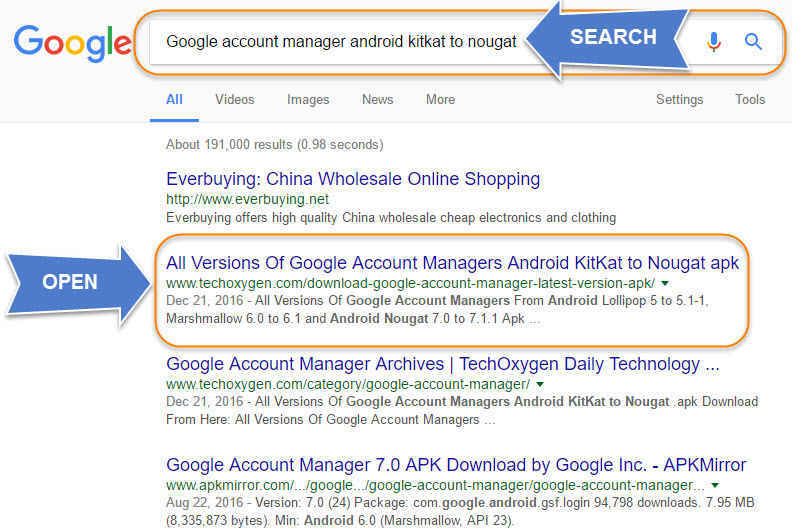 6th Step: On Google search bar type and search for “Google Account Manager Kitkat to Nougat” go to the result with Techoxygen.com. Inside the website, Download (Google Account Manager 6.0.1 January 14, 2016 or Lollipop 5.1-1743759) first use one of these manager if it doesn’t work then download the latest version and apply the next steps. 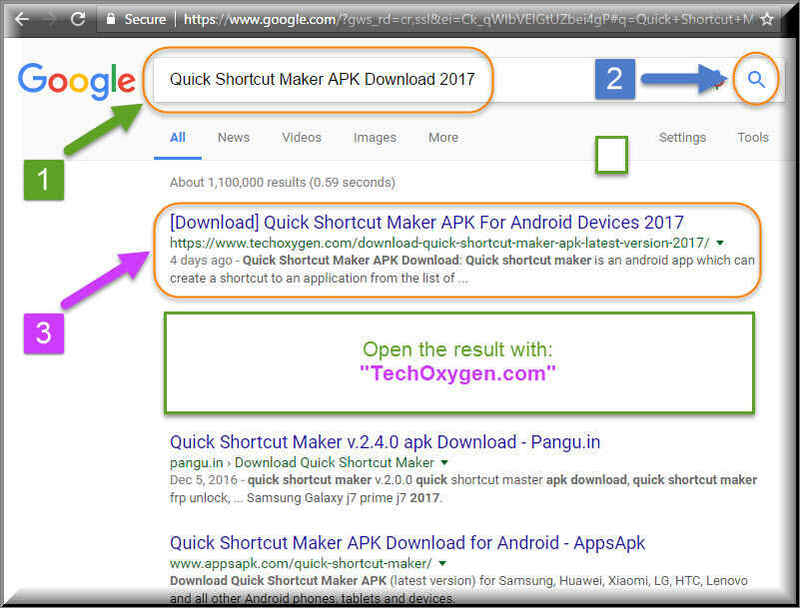 Go back< to the Google Search Bar and type Quick Shortcut Maker 2017 and go to the result with TechOxygen. 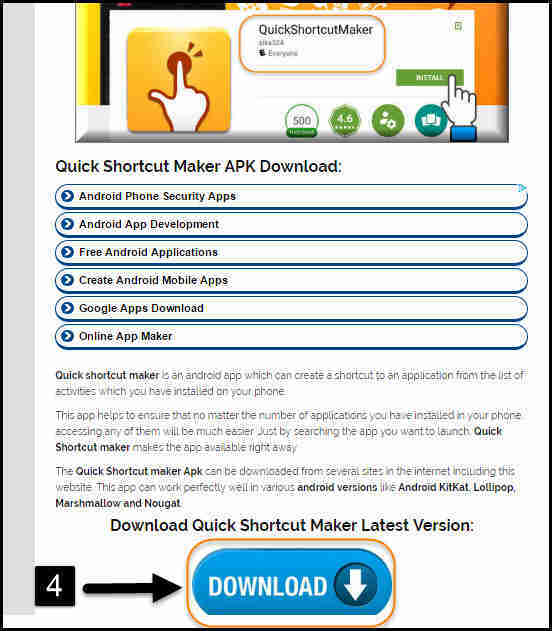 then scroll down and download the QuickShortcutMaker.Apk. 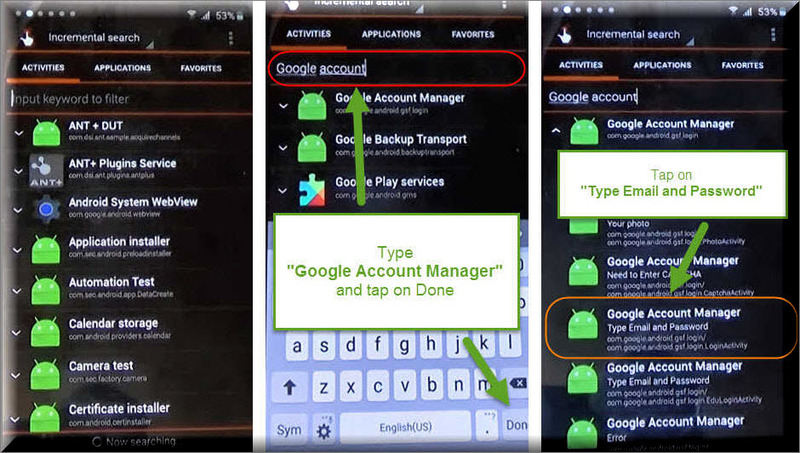 This app will help you to locate the downloaded Google account manager form your phone to activate Samsung FRP bypass method. 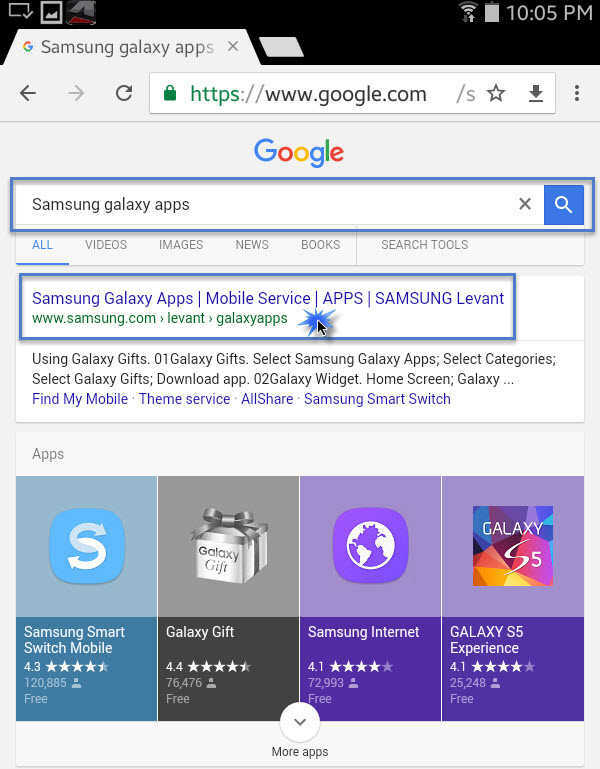 Again Go back < to Google search bar and type Galaxy Apps and go the first result. 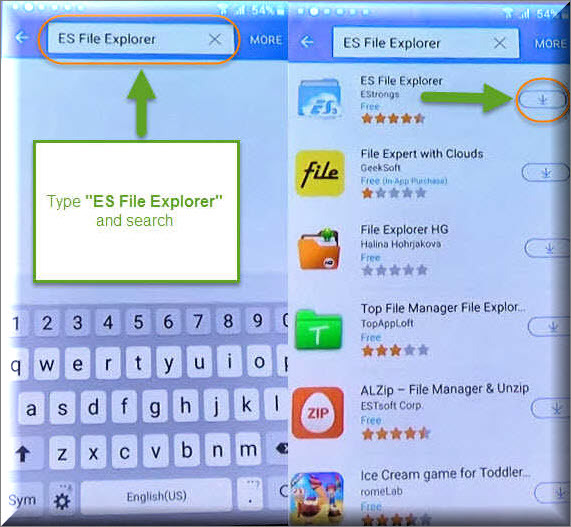 7th Step: Similarly, Scroll down and tap over Samsung Galaxy Apps now on the search bar of Galaxy Apps type Es File Explorer and tap on the Download button. 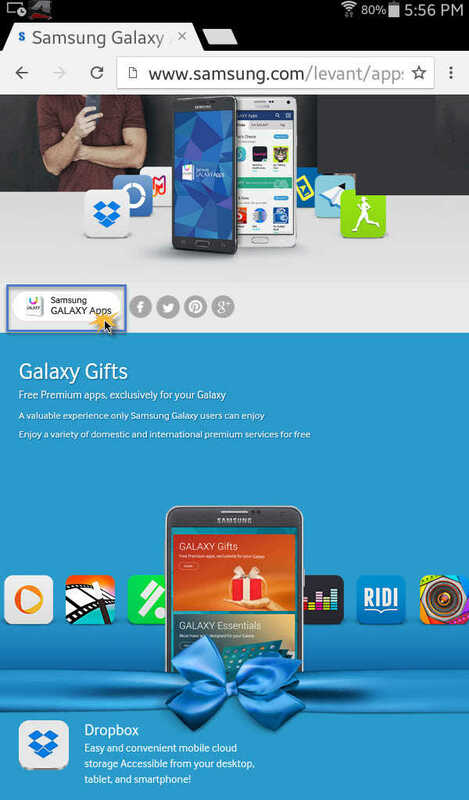 To download this application you need to login with Samsung Account. If you don’t have an account you can create and login with it and then download the apk. Then you will be able to Samsung FRP bypass apk your device. Once the download completed, Open the APK and go to Download folder (Here you’ll found the applications which you downloaded before). First open the Google Account Manager.apk and go to Settings> enable Unknown Sources> tap OK > and finally Install>. Tap on Done> and now install Quick shortcut maker, Go to settings> enable unknown sources> and tap over install. Last Step: Open the application, on the search bar type Google account manager and select the first result. Here you’ll see a list of Google Account Managers, select the result with Type email and Password. Then tap over /Try and tap “:” three points on the top right hand corner of screen and select Browser Sign-in. Now you can enter your own Google Account details. 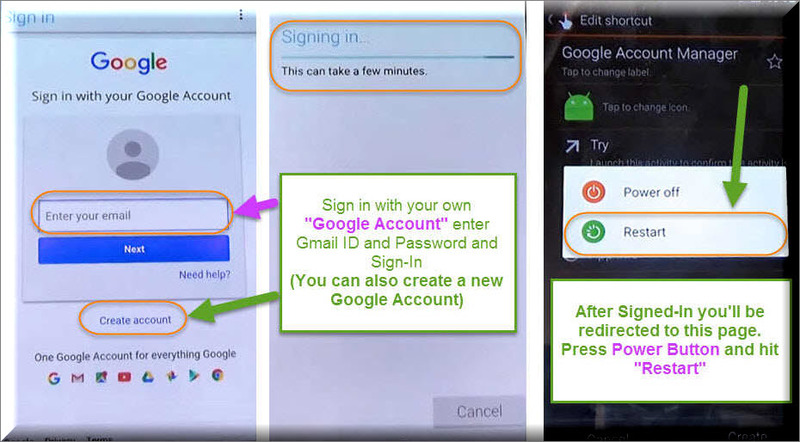 Just enter the Gmail ID and Password of your own Google account, If you don’t have any account you can also create a new account then sign-in with that. Just after Signing-in with your Google Account, You’ll be redirected to the Google Account Manager screen. Press Power Button and hit Restart. Congratulations, after restarting Samsung Galaxy Phone, You can Complete the initial setup without any Google Verification Screen or bypass Factory Reset Protection FRP bypass lock. 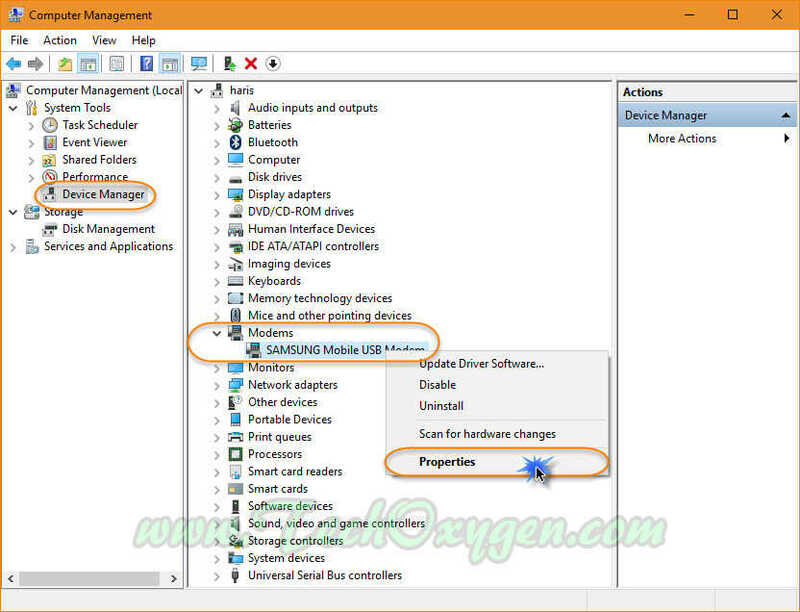 You must Soft Reset your device after breaking the Samsung FRP bypass Lock. Go to Settings > Backup and Reset > Factory Data Reset > and Reset Phone. 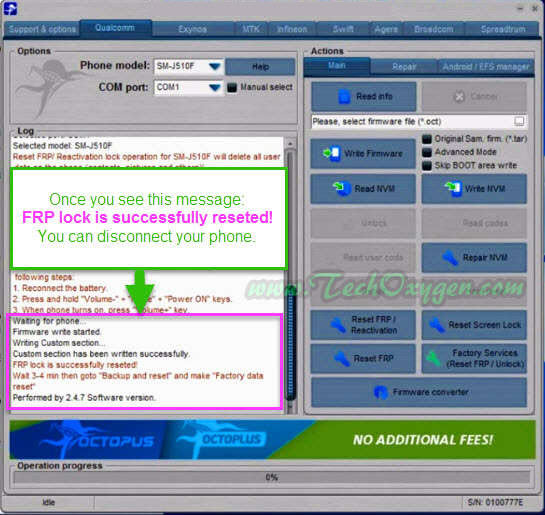 Last Words: I’m sure this clear elaborated step-by-step method to remove “Samsung FRP bypass” lock from Samsung Galaxy devices helped you to delete or remove FRP lock security lock. For any kind of help feel free to comment below. 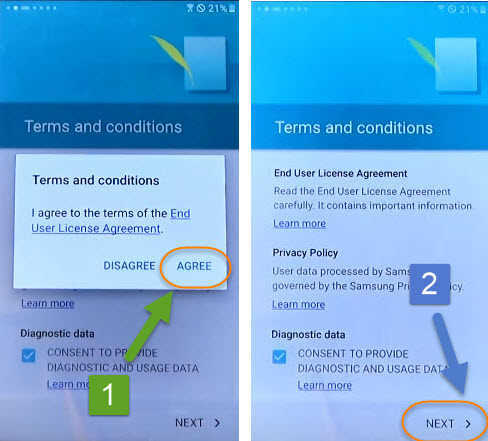 Samsung FRP Tool download free for PC to delete Google account verification lock completely from Samsung Galaxy devices. I know lots of you stuck with the so called “FRP lock” on your devices after hard resetting it. But now what? You don’t know about the Google Account details which was submitted to your device? Right? 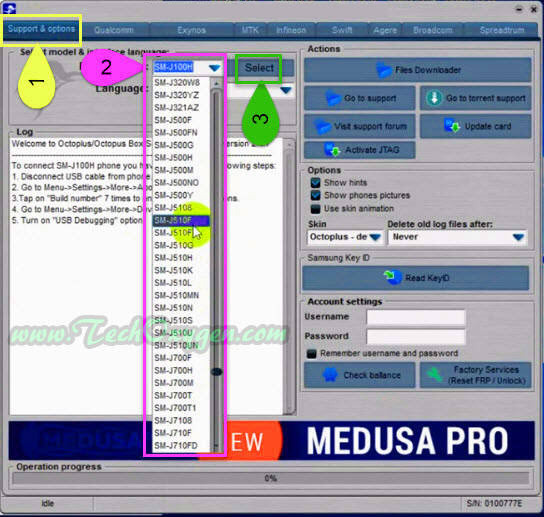 Now, of course you want to break that security feature which is activated due to the factory resetting and that can be done using “Samsung FRP Tool for PC” with some easy steps. By the way, let me just tel you one thing! 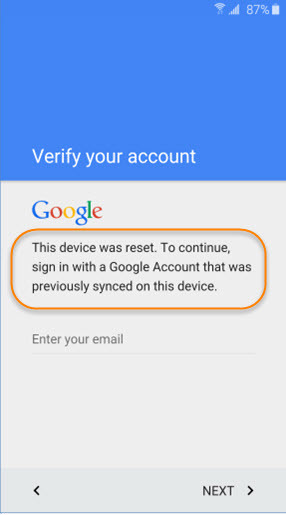 The Google account details are very important to know which are synced in your device. Because whenever you hard reset or factory reset your Samsung Galaxy device it will ask you to enter the right Google account details. But what if you forget about the details of that Google account? Well, if you are one of them, then you are on a right place. I know how to deal with this security FRP lock and i will tel you how you can deal with it too using “Samsung FRP bypass tool” with some easy steps. 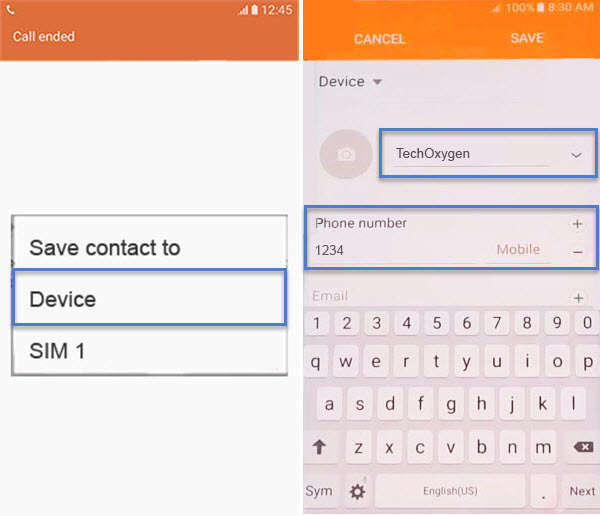 First thing first, I won’t tel you to use any OTG Cable, RealTerm software or Odin for this latest FRP bypass lock 2019 method. Not only that you also don’t need to use Combination File. 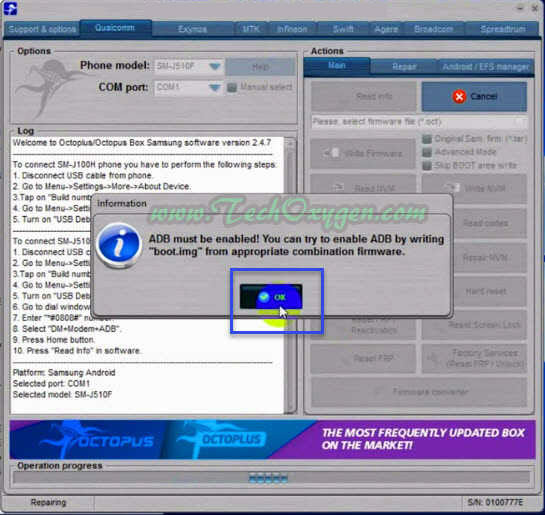 As for this method we are going to use “FRP bypass tool” which is latest version Octopus Samsung FRP unlock tool. This method is beyond all other methods as you don’t need to cover all those step-by-step long procedures. (But they are still very helpful) to unlock Samsung Galaxy devices. 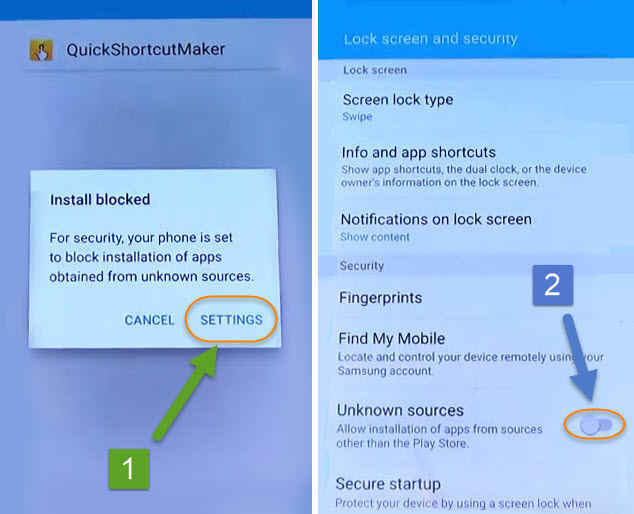 For now, I made this guide with some of the most easiest steps so that anyone can break that FRP lock using “Samsung FRP Tool” for their devices. 3: Once you see WARNING ICON on you screen let go all the buttons. Here it will show you this message: A custom OS can cause critical problems in phone and installed applications. 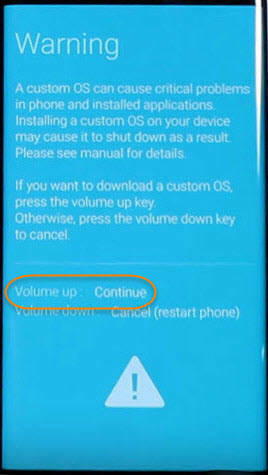 4: Press Volume UP to Boot your Samsung phone into Download Mode. 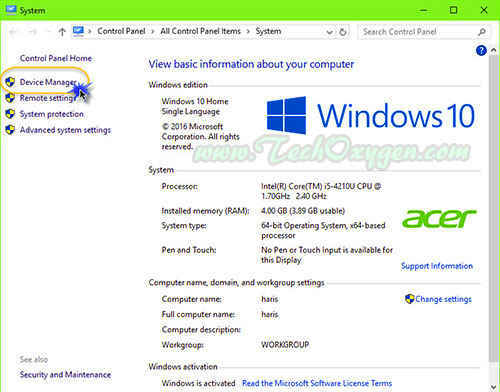 2 Step: Install USB drivers in PC and connect your phone using USB data cable. Inside properties click on Device Manager. 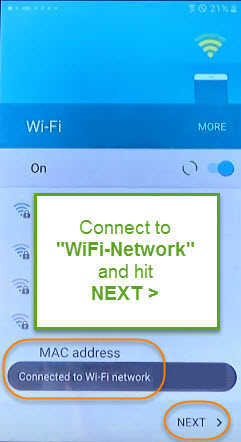 4 Step: Make sure your device is connected with computer, by clicking on Modems option you can check if your device is connected or not. 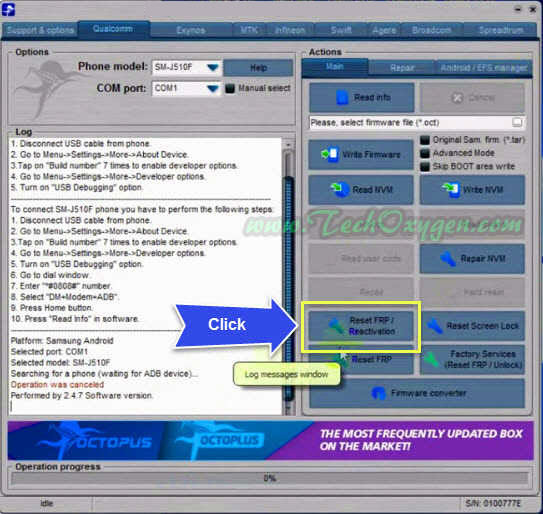 5 Step: After installing it, Open Octopus “Samsung FRP Bypass Tool” and click on Support & Options then in Phone Model tab select your Samsung device model number and hit on Select button. 6 Step: Now from the Actions sections, click on “Reset FRP lock” tab which is 2nd last option of this section. 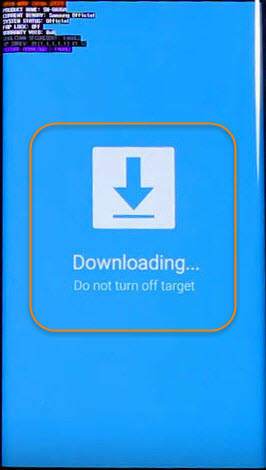 7 Step: Maybe a pop-up window will appear on your screen with: ADB must be enabled! 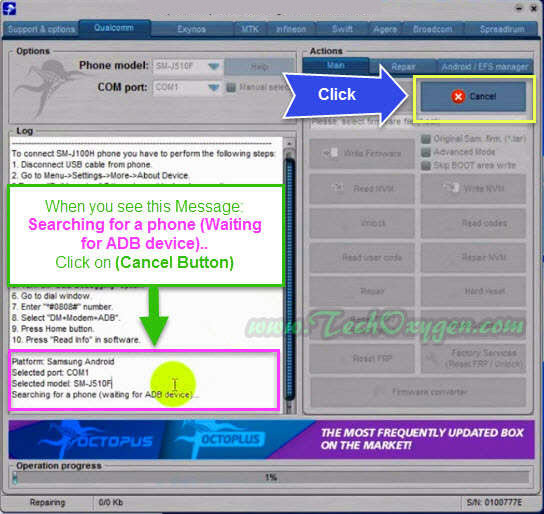 You can try to enable ABD.. click on OK.
8 Step: As you can see in the LOG section of Samsung FRP tool, the last message with: Searching for a phone (Waiting for ADB device)..
9 Step: From the Actions section, click on x Cancel button and then click “Reset FRP/Reactivations” button from the same section. Just select YES and then in a couple of seconds Factory Reset Protection lock will be removed completely from your Samsung Galaxy device. It was that easy to unlock FRP from Samsung Galaxy device. You don’t need to download Combination file and neither need to use OTG Cable. All you need is “Samsung FRP Bypass Tool”. This methods works for Samsung Galaxy J5, J7, Note 7, S5, S6, S7, S6 edge, S7 edge and all other Samsung devices.